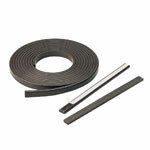 Flexible magnets are produced in a ferrite magnet material mixed with a flexible rubber binder which is then extruded or calendared to create profiles, tapes and sheets. The flexible magnetic rubber is multiple poled on one side (some versions, termed anisotropic) is magnetic on both sides. 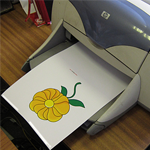 Extra options include vinyl finish, dry wipe, printed, etc. 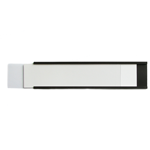 Our flexible magnets are ideal for a variety of display applications including retail and vehicle signage. 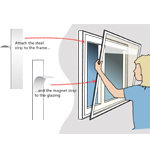 They are made by binding strontium ferrite magnet into a flexible thermo-plastic binder which is then calendered into sheet or extruded into strip. 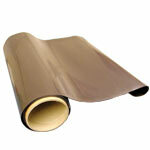 Any colour can be achieved by laminating the material. 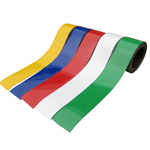 Colour faced sheet is laminated with a PVC film on the non-magnetic face. The degree of flexibility depends on the cross section of the profile. 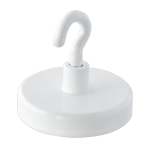 All strips can be coiled around a 100mm diameter former without damage. 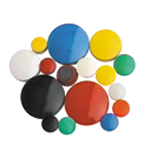 Marker Magnets consist of magnet material in a coloured plastic shell. 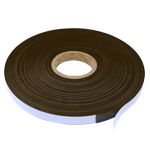 Adhesive-backed steel tape can be used with the matching width adhesive-backed magnetic tape to provide temporary and semi-permanent fixings. 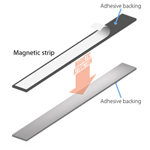 The magnetic steel tape is supplied with standard acrylic adhesive.